Your vineyard is a very large investment and deserves to have a protection package that reflects its value to you. Ted Hamm Insurance Agency has been creating individualized plans for vineyards for over 30 years. We have been involved with vineyards from ground breaking all the way through harvest. Each stage of the vineyard growth has its own special needs. 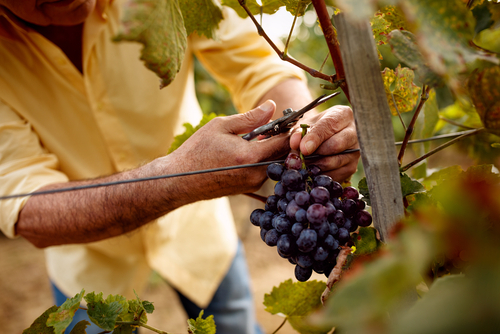 We can make sure that your Vineyard Insurance coverage reflects your needs. Vineyard Protection With The Custom Coverages You Need! Buildings and structures are covered through your policy as part of your protection plan. Tractors, harvesters and other equipment are covered under the inland marine insurance as a key piece of your California Vineyard Insurance package. Transportation Issues - Are your grapes covered on the way to the winery. If you are hauling your own, you need to have cargo coverage. You should also check with any contract hauler to make sure they have your grapes protected all the way to the winery. Call Today, For Your Peace Of mind! Insuring your vineyard does not have to be complicated. With the number of vineyards we currently insure we have seen what is needed and have protected our clients. We will walk you through the entire process in the most effective and painless way we know how. We are happy to come out to the vineyard and walk it with you to see your special needs. From the vines, to the well, to the equipment and buildings we have a protection plan that will keep your assets protected. We will take the questions out of your Vineyard Insurance and take the time to explain it to you. At Ted Hamm Insurance Agency we have protected the vineyards of Paso Robles, California since 1977. We know the area. We know the properties. We know how to protect you with the right type of insurance for your vineyard. Even better we live here and know what is happening to your crop almost as soon as you do. Complete the Protection Savings Form now and let the professionals at Ted Hamm Insurance Agency create an insurance plan just for you. The central coast of California has a wonderful reputation for its wine and it is you the vineyard owners that make it possible. We are honored to work with Paso Robles Vineyard owners as they have proved to the world the quality being grown here. Let us protect you today!